GARRET MEADE PHOTO | Mattituck junior Kevin Williams scored the Tuckers’ lone goal Thursday against Babylon. To the casual observer, a Mattituck boys soccer game features plenty of excitement. A team filled with youth and talent, the Tuckers can bombard teams with shots, creating many more scoring opportunities than their opponent. But turning all those opportunities into goals has been the challenge, making for more excitement in the end than coach Mat Litchhult would prefer. Such was the case Thursday afternoon against Babylon, a team still winless on the season. The Tuckers tallied double-digit corner kicks, dominated possession and peppered Babylon’s goalkeeper with shots. Still, in the final minute, the score was merely 1-0 Mattituck, creating a tense, nerve-wracking finish. The Tuckers held on for a 1-0 win on their home field to maintain their place atop League VII with a 6-1 record. Keeping a team around late in the game almost came back to bite the Tuckers when Babylon nearly scored on a header with about two minutes left. A strong throw-in from the right sideline put the ball in front of the net almost as if it was a corner kick. A Babylon player managed to sneak in amid a crowd and head the ball, forcing Mattituck goalkeeper Stephen Ostrowski to make a diving stop to his right. Ostrowski wasn’t challenged often, but when he was in the final minutes, he proved up to the challenge. The Tuckers scored their only goal after junior Kaan Ilgin chipped in a ball on the right side for junior Kevin Williams. Babylon’s goalkeeper came charging out, got a touch on the ball, but couldn’t corral it. Williams, between a swarm of two defenders, kept his composure to keep possession and aim a shot at the empty net. The goal came in the 44th minute. The Tuckers, 6-2 overall, bounced back from their first league loss, which came last week against Hampton Bays, 1-0. In their last three games, which started with an impressive road win at Center Moriches, the Tuckers have managed just two goals. “When we bust out, we’re going to bust out with like seven goals,” Litchhult said. Mattituck returns to action Monday at Southampton. The Tuckers won the first matchup, 2-1. The Mattituck High School boys soccer team ran into a hot goalkeeper on the last full day of the summer on a sunny and windy Saturday afternoon. Senior Ryan Blake put on a goalkeeping clinic, keeping Westhampton Beach within striking distance of the defending Suffolk County Class B champions. But Blake proved to be only human. He could not stop every shot sent his way in what turned into a 2-0 non-league victory for the Tuckers at Carl Hansen Memorial Field in Westhampton Beach. When the Tuckers did, they scored. Junior forward Kaan Ilgin set up James Hayes’ first-half goal off his corner kick and added an insurance goal in the second half. Mattituck recorded its fourth consecutive win after a season-opening loss. The Hurricanes fell to 0-5-1. The Tuckers hope they will not meet a goalkeeper in Blake’s class soon again. He made 18 saves, many of high quality. “Awesome game,” Hurricanes coach Don O’Brien told Blake, who had to run off after the match for another commitment. The Tuckers probably had wished he could have left slightly earlier. Ilgin played playmaker as his corner kick was headed in by Hayes at the near right post with 16 minutes 11 seconds remaining in the opening half. Mattituck pushed for a goal, but Blake had some other ideas. So did his teammates, who tried for an equalizer, which would have been devastating for the visitors. The attack finally solved Blake from the run of play with 21:18 left in the game. Ilgin, who had been denied in and around the penalty area, decided to launch a 30-yard attempt from the right side that beat Blake. “I took it long distance because every time I dribbled, they closed space, so I just shot,” he said. Hungry to add to their lead, the Tuckers were awarded a 20-yard free kick from the left side. Williams, who smacked in a superb 28-yard free kick in a 2-1 win over Southampton four days earlier, tried to make it a double within a week as he fired a hard shot over the defensive wall toward the upper left corner. “There it is,” said Litchhult, standing with O’Brien at midfield. And there was Blake, who had been positioned at the far post, but managed to scurry across the net, leap and parry the ball away. Williams has liked what he has seen. 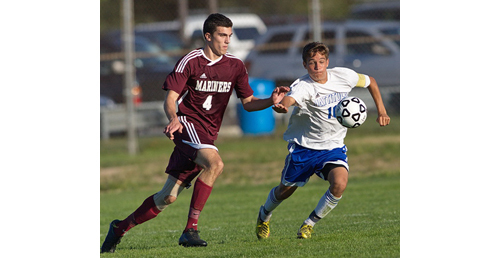 GARRET MEADE PHOTO | Southampton’s Elliot LaGuardia and Mattituck’s Paul Hayes in pursuit of the ball. Free-kick taking is an art, and what Kevin Williams crafted on Tuesday was a thing of beauty. At least in Mattituck eyes. For over an hour of play in the Southampton-Mattituck boys soccer game, neither team had scored, and one began to wonder if either would before the day was over. Then, in the 64th minute, Mattituck was awarded a direct free kick 28 yards in front of the Southampton goal. Mattituck’s free-kick responsibilities are shared by the left-footed Kaan Ilgin and Williams, who prefers his right foot. Ilgin deferred to Williams, and the junior central defender stepped up to take the kick. What makes taking a direct free kick in such situations so tricky is that the kicker must strike the ball high enough to go over the defensive wall, yet not so high that it rises over the crossbar. At the same time, the shot must have the power and the placement to beat the goalkeeper. Williams’ attempt had all of the above. “I thought it was going to hit the crossbar, and in the last second it looked like it dipped a lot,” he said. The ball flew into the net, to the right of flying goalkeeper Garrett Pike for Williams’ first goal of the young season. It was the sort of goal players dream about. GARRET MEADE PHOTO | Mattituck junior forward Kaan Ilgin assisted on the winning goal, put 3 of his 4 shots on goal and completed 21 of 29 passes. It was the first of 3 goals within a span of 3 minutes 43 seconds in the Suffolk County League VII game, leaving Mattituck with a 2-1 victory in its home opener. Hayes spotted Mattituck a 2-0 lead 2:20 after Williams’ strike. But it was the first goal, the ice-breaker, that was the most impressive. Moments after the first goal, Ilgin slid a cutting pass into the penalty area for Hayes, who then slid the ball under Pike for a 2-0 lead and Hayes’ second goal of the season. Ilgin is a tremendously skilled player. “His technical ability on the ball is some of the best I’ve ever seen,” said Litchhult. The junior forward had 49 touches on the ball, put 3 of his 4 shots on goal, and connected on 21 of 29 passes. Southampton (2-2, 1-2) pulled itself back in the game 1:23 later when Elliot LaGuardia knocked the ball between goalkeeper Steve Ostrowski’s legs. Four minutes into the game, Ilgin nearly set up a goal by Mario Arreola, only to see Southampton’s Tyler Wisner clear the ball. Another close call came six minutes into the second half when Hayes passed to Oswaldo Aldaz, whose creative flick nearly reached the net before Southampton’s Kevin Dexter booted the ball to safety. Mattituck survived a couple of threatening shots by Southampton’s Ezekiel Martinez that barely missed their target in the second half. All in all, it was a good showing by the Tuckers. Mattituck, a New York State Class B semifinalist last year, once again has plenty of talent. At the same time, the team is young. Only two of Mattituck’s 25 players are seniors, Aldaz and Ostrowski. Expectations are high. An occasional goal off a set piece wouldn’t hurt, either. Williams is the first to acknowledge that the majority of free kicks don’t find their mark, instead sailing over the crossbar, going wide or hitting the wall.